I was a very young boy when my Abel grandparents still farmed on County Trunk E in the Town of Fairburn, about five miles west of the city of Berlin. I remember their farm but only in a hazy, very sketchy way. I have two old photographs taken during one of our family visits. In one I'm sitting with my two older brothers on the steps of their front porch. In the other I'm sitting on their grassless front lawn playing with a cat. I'm probably three or four and dressed in what had to be my Sunday best. About 1940 my grandparents retired from farming and built a brick house on Liberty Street in Berlin. This is the place I remember best. It was unlike any house I had seen; a finished basement with white painted walls, a floor of new concrete, and a large furnace that I was told provided heat to each room through a series of pipes and heat vents. The living room featured a brick fireplace with a wooden mantel holding framed photographs including one of my Uncle Clarence in his army uniform. But the two house features that drew most of my attention, other than the hard candy grandpa kept in a jar on their enclosed front porch, was a coffee grinder in the basement and clothes chutes, two of them, one located off the kitchen, the other in the upstairs hallway. Running up and down the stairs throwing things down the chute, speaking into it, and listening for secret conversations my older brothers and cousins might be involved in unsettled my grandmother, as did the thought that her grandchildren were playing with her coffee grinder which, of course, we were. It is no wonder that she always seemed on edge when her second daughter's family came to pay a visit. We didn't visit our Berlin grandparents often. My parents did not own a car during most of my growing-up years so we usually depended on Uncle Clarence or my Uncle Ed for transportation when a visit was planned. That may have weighed heavily on my parents. But --- looking back, there may have been other reasons too. We had a large family - five boys when most of the visiting occurred. Five boys who were not always well-behaved. Five boys who like to run, laugh, make noise, create disturbances, get into mischief. Five boys who acted like, well, five boys. And it became clear, in the eyes of one of her grandsons, that his grandmother didn't think much of her La Point son-in-law. He picked up from her feelings that his dad was not accepted as a member of her family, that his drinking interfered with his husbandly and fatherly duties, that her daughter had not made a good choice for a mate. The boy's guess is that his dad was not insensitive to this. His mother certainly wasn't. As a consequence we didn't see the Abel grandparents often. And, when we did, we came away with the feeling - at least one of Russell's boys did - that it was not an enjoyable time for them. Grandma died of cancer in January, 1952. Our family visited a few weeks before she passed on. The grandmother I once knew no longer looked like the grandmother I once knew. This once, large, robust woman was now a mere skeleton of herself. Even at 16 her frail body frightened me. Grandpa lived into his eighties and died some fourteen years later. 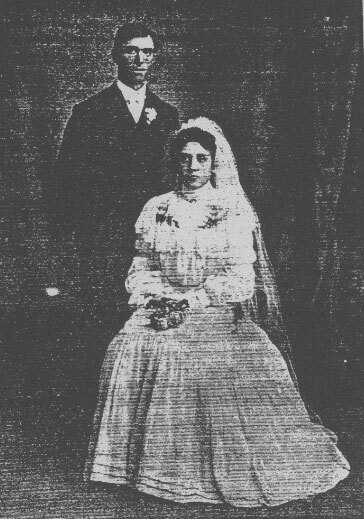 My grandparents Paul (1877-1962) and Bertha Schroeder Abel (1885-1952) on their wedding day, April 26, 1904. The Abel children. 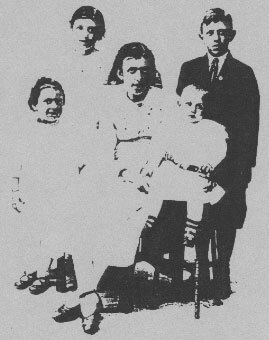 Standing: Frieda, Ella, Herbert. Seated: Hertha, Clarence. Picture taken about 1920. 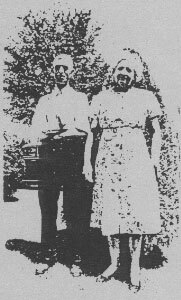 Grandpa and Grandma Abel. This is how I remember them.